Community leaders are the change makers... not us.. In Jafet, the Mziza farming club have a leader who motivates by example. Whenever a club member is disheartened and says, "I cannot do this! ", Jafet is there to say "Yes you can! I have done it and I will help you!" Other leaders in the agriculture sector face the challenge of being seen as part of an out-group that cannot understand the farming processes of the village. University students, government extension workers, NGOs, commercial farmers, and, perhaps most of all, whites, cannot effectively motivate farmers because they lack the common ground of poverty, subsistence farming, village life, and cultural background. So what do all these well-meaning leaders do? One successful technique is to motivate slow change through identifying and promoting positive deviance. Positive deviance is a deviation from group norms that results in positive outcomes. For example, in a local culture that promotes marriage for girls 14 years of age, a girl whose family encouraged her to complete school before marriage might have a more sanitary home and provide healthier food to her own children. This is positive deviance. It is the seed of change in the community that only needs to grow; that is, it's not planted from outside. Because the deviant practice was already present in the community, it can be passed on without the resistance faced by alien practices. So here's Jafet, a noted farmer who has adopted a new method of irrigation. But it was not this new method alone that has given him success: he completed all 12 years of school, he keeps records and saves money, and he maintains a strict working schedule. He would be a successful farmer with almost any method. Of course, the better the method, the better he will do, but as I noted in a previous post, he's going to take his opportunities and run them out to their potential no matter what. Jafet is in the process of constructing a house for his oldest son, one of the surest signs of wealth in this culture. Oh yeah, and he's renovating his own house by adding a new kitchen and sheet metal roof. 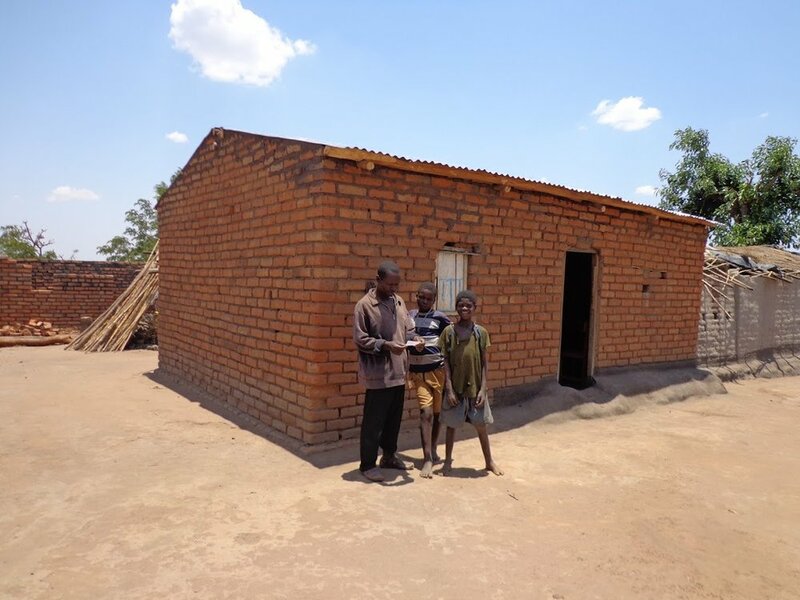 By the time his sons house is ready, he hopes to be able to afford metal sheets for that roof as well. In September, Jafet told us that he had sold MK96,000 ($350) in vegetables in 2011, and expected to make MK150,000 ($475) to MK200,000 ($700) in 2012, on irrigation farming only. He also has an income from rainy season crops. And these two income sources have a synergizing effect, as each provides capital to improve the other. And the monetary value of the crops doesn't account for the nutritional benefits to his household. And he teaches other farmers to do the same. And.. And... And.... Can you tell we are proud of amazed by Jafet? He's not the only one: Mr. Storo grew maize and was able to send one of his daughters to secondary school for the first time in 3 years. Mr. Matenga was able to buy a brand-new bicycle (think: promotion = buy a sports car, only a bicycle is far more useful). While their success may not be as flashy, dozens of others have achieved food security following last years minor drought and light harvest. Farmers are still planting on irrigation in advance of the rains. This crop will finish under rains in January. Another crop will be started with the rain and finished with pump irrigation. Technologies are there to help people work efficiently and effectively in any sector of development. In irrigation development, so many technologies have been developed to assist in irrigation farming. However, the drawback has been that these technologies have kept on demanding man power when it comes to operating the technology and frequent attention. Farmers in rural communities do face the hustles and hurdles of operating these kinds of irrigation technologies. The time and energy spent on operating these technologies could be of use in quality establishment of an irrigation system. Africa Windmill Project is in Malawi to take care of problems faced by farmers interested to embark on irrigation farming. The organization is developing irrigation technologies that could be of profound help to medium to small scale irrigation farmers. One of the irrigation technologies that can perform wonders for irrigation farmers is the wind water pump. The picture you see above is a wind powered water pump developed by Africa Windmill Project in Malawi and placed at the our irrigation demonstration plot. The water pump is made out of bamboos (60%), blue gum pole, few steel (at pivotal point, nails and wire,), reused materials (5l and 25 liter containers and glass bottles) and plastic pipes and polyethylene sacks. The pump auto-operates under the influence of winds. As the winds blow, all four panels swirl towards one direction, forcing the rope with washers to rotate also. As the rope is rotating, washers tied to the rope at intervals pump water inside the pump carrying it through to the outlet pipe. In the AWP irrigation demonstration plot, the outlet pipe exit water into the irrigation reservoir tank. The pump is highly effective. It pumps water, every time the wind blows at the four panels. The more the wind blows, the faster the water resource is drained. In other words, the flow rate of the pump is equaled to recharge rate of the well. The wind powered water pump is designed to pump water into the reservoir. This is the technology that if properly improved on will help in irrigation development and assist in reducing the effect of food insecurity and financial insufficiency in rural households. Farming club members now have resident bees in their beehives that will provide honeys to the farmers. It has been about 2 months since we established the beekeeping initiative. Three months from now, farmers will harvest up to 100 liters (30 gallons) of honey.